If you are traveling in Belgium, Bruges is certainly one of the must-visit destinations - it tends to receive even more compliments than the capital city, Brussels. Booking a hostel in Bruges may be challenging during peak season as the city is mostly packed with tourists or expatriates. 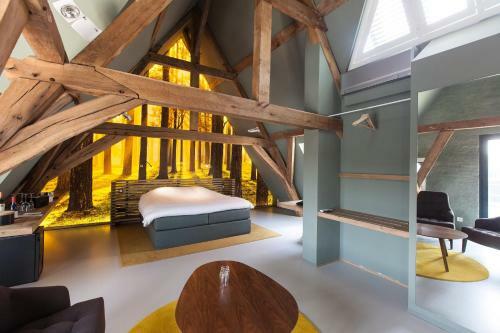 However, take a look at the Bauhaus Hostel, which is only a short walk to the Bruges Old Town and other famous landmarks. Step forth and explore Bruges! The Bauhaus Hostel lies in a typical medieval building. The hostel’s interior design, with a massive chandelier, wooden furniture, and walls and decorations made of bricks, creates a medieval atmosphere inside the main hang-out area of the Bauhaus Hostel. At Bauhaus, you will have the feeling of living in the past while savouring ‘Spiced Ale’ and ‘Grand Cru’ beer at its classic antique bar. Belgium began producing beer in the 13th century and now produces about 500 different types of beer; Belgium is definitely a ‘beer country.’ In honour of the Belgian beer drinking tradition, the Bauhaus staff has stocked a range of Belgian’s finest beers on tap and a long list of bottled beers from all across the country for you to sample. At Bauhaus, there are more than 25 types of beers offered, including some of the most rare and local types, such as Trappist and Brugge Rot. Order your favourite Belgian beer or take your time tasting different famous beer, and sit with another hostel guest to have a chat. The bar is open every day between 10 AM and 2 AM. In contrast to its exterior, the Bauhaus Hostel offers modern accommodation choices including regular dorm rooms (4 to 8 beds), pod bed dorm rooms (5 to 10 beds and 1 to 8 beds), and private rooms (2 to 5 beds). Female-only dorms are also available. I recommend booking the pod beds, though they are slightly more expensive than beds in the 8-bed dorms. Pod beds are equipped with individual reading lights, power sockets, USB points, privacy curtains, and individual luggage storage spaces. These beds are designed especially for modern travelers with extra space and comfort in mind. The prices for beds start from 16 EUR (18 USD) but there is about a 2 EUR (2.5 USD) city tax not included, which you must pay when checking in. There are many shared bathrooms and showers located in the main hallway. If you forget to bring a towel, you can buy or rent one from reception. If you are travelling with friends or family in a small group, check out their spacious apartments available for short-term rent. Enjoy your time in the food country! Belgium is the land of food, with a well-known fame for mussels, fries, waffles, chocolate, and many other dishes with strong culinary influences from both France and the Netherlands! Thus, don’t hesitate to ask reception where to either eat cheaply or dine in high-quality restaurants in town. A free city map is provided, which marks the most important attractions and well-known places to eat and drink in Bruges. There’s no kitchen available for cooking but free breakfast is always included. You can also store food in the fridge if you ask the receptionist. It’s also possible to order takeaway food (e.g. pizza, pasta) from reception. The Bauhaus staff have shortlisted some of their favourite things to do in Bruges on the hostel’s website. These include visiting the chocolate line, taking a canal boat tour, having brunch/coffee/cake at Het Dagelijks Brood, and more. Bauhaus is also one of the daily meeting points for a free walking tour around Bruges. In the summer, you can even rent a bike to go with a guide to explore Bruges, visit the Dutch border, or bike to the beach.